The production team of MBC Wednesday and Thursday drama The Moon that Embraces the Sun does not rest during the Lunar New Year (Spring Festival), still busy shooting. Jung Il Woo who plays the role of Prince Yang Myung tweeted on his Twitter account on January 21st, 2012, “Because of continuous filming throughout the night, the dark circles are almost came to the knee, but coming to Spring Festival, I’m still very happy. I am currently in shooting, sending everybody a happy holiday greeting in advance,” and followed up with a lunar new year greeting. He also posted a photo, which is a on the set photo of Jung Il Woo during the rest from filming. 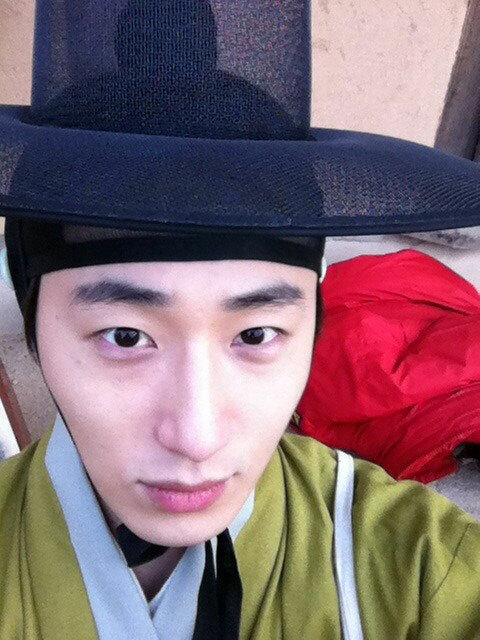 In the photo, Jung Il Woo wore a green hanbok, black gauze cap, and is expressionless. Under the fair skin, the dark circles seemed terrible. Netizens who saw the photo encouraged Prince Yang Myung one after another, “Jung Il Woo who is still let the hearts pounding as before!” “Much happiness in the new year, hope can eat the rice cake soup,” “Very miss you!” “Broccolis helps to get rid of dark circles,” “I like The Moon that Embraces the Sun,” and so on.